The wide-raging functionality of eso/es improves your business processes in Finance, Purchasing and Warehouse, Sales, Shipping, Production and Production Management. Advanced MRP and CRP Planning Methods. Kanban and Supermarket Support. Prioritised production and optimised use of production capacity. Your business representatives’ CRM is synchronised with your core business system. Ergonomic user environment. No duplicate entries, quick overviews, charts, gantt diagrams, user customised forms. Powerful, hierarchically organised reporting system. Ad Hoc Query Tools, Report Generator, Dashboard System. 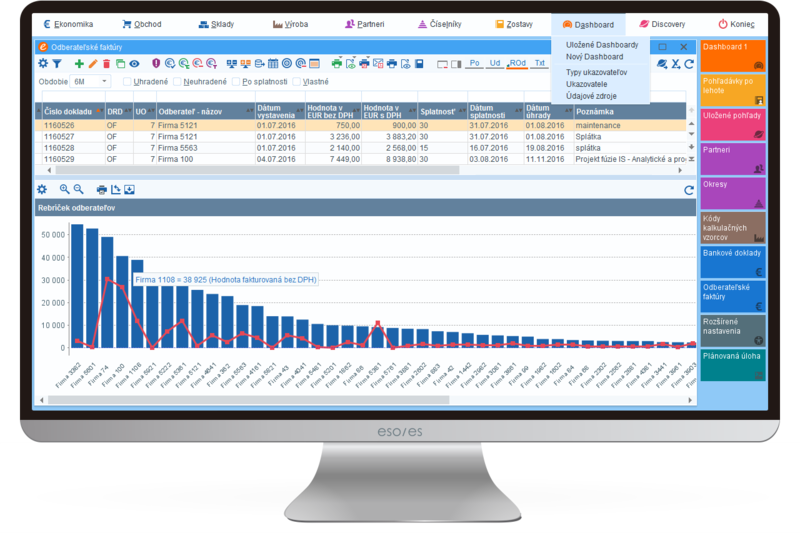 eso/Discovery, your fast and intuitive analytical tool to help you make the right decisions. ... and much more. Improvements to the application are made constantly. “Cloud ready” architecture. The eso/es information system is ready to work at data centres with a virtual environment. eso/es Client can easily work with your eso/es application over the Internet. Platform-independent application supporting Linux, Windows, AIX, OS/400, and Solaris. High performance system capable of managing the work of hundreds of users. Thanks to its three-tier architecture and in-memory technology it can be installed at smaller businesses as well as at large corporations. The modern eso/es framework enables its rapid development. A knowledgeable, experienced and constantly trained team. Communicative, helpful and customer oriented staff. Proven and constantly improved methodology. Experienced consultants ready to transfer their know-how. Individual approach to each project. eso/es can be easily adapted to fit specific processes and customer requirements. eso/es is implemented by consultants backed by a team of developers. Reduced response time to different customer requirements. Default parameters by industry and country. Two to six month implementation time regardless of project scope. The nature of our software makes it highly flexible - faster response to customer requirements. Consultants backed by a whole team of developers. Above standard Individual Service Terms (SLA). Projects proven over 22 years of experience. Satisfied customers from different industries and all size ranges. Sales and distribution companies with different business lines. It is ideal for geographically dispersed companies requiring shops and/or warehouses operating online. Financial institutions. It can enhance basic banking or insurance software. For this purpose are especially suitable the modules: finance, purchasing and storage, sales, BI mis / es, reporting, dashboard, and the like. Special Areas. Worth mentioning are claims trading companies as well as health institutions. ERP eso/es is ideal for mid-size and large enterprises. Corporations. Multinational companies highly appreciate the fact that eso/es is ready to "move to cloud" i.e. they can share a central database and consolidate data easily while working in different languages pursuant different legislation environments and international accounting standards (IAS/IFSR). The system implementation, or IS delivery project, basically depends on the specific demands your enterprise has on the new system. Special attention is paid to eso/es implementation, and the methodology for it has been continuously improved for over 23 years. PRINCE2 and KANBAN are management frameworks we use for tailored developments. eso/es is exclusively implemented by HT Solution’s own consultants, who are ready to pass on their expertise from previous projects and who can rely on our own team of developers. This way System Implementation is not only faster and trouble-free, but it can also include your specific business processes and demands. Start. Kick-off meeting. The project teams of both parties are created and the project schedule is defined. Analysis and Design. SWOT analysis of existing business processes and needs, documenting all business processes, documents and IS-related correspondence flow. Bottle-necks and key spots are identified. Optimised processes are drafted in line with the project objectives. A short and long-term conception of how the company's performance is to be improved once eso/es is in commission is worked out. The result of this milestone is a document called “Target Concept”, according to which the following implementation stages are carried out. This document needs to be approved by both parties. Implementation. Once the solution is “customised”, the application is installed and the data from the old system is migrated into the new one. Training, hand-over, testing, pilot operation. “Go live.” The different eso/es processes go gradually into operational production. Increased supervision and hotline support. Putting ERP eso/es in productive operation does not take more than 6 months regardless of the scope of the project. eso/es is supported by experienced consultants directly from their workplace. Response time to even the more demanding customer requests is thus substantially reduced. eso/es customers highly appreciate this support. The Terms of Service are stipulated in the contract according to the individual needs of each customer. Technology Key Words JAVA, J2EE, Swing, IBM WebSphere AS, Android, HTML, SOA, In-memory, etc. Remote Access Clients can use eso/es on-line over the Internet. No Citrix or Windows Terminal Services needed. Communications Options WebServices, RMI, CORBA, EDI, XML, Stored Procedures. To different HW - RS232, TCPIP, etc.